Are there any rock star surname names on your shortlist? “Heroes” by David Bowie is my favorite song, and if I were expecting a son right now, I’d seriously consider how to incorporate Bowie into his name. It wasn’t on my radar until we heard that the legendary artist had passed away earlier this week. But now? It seems like the most obvious of choices. 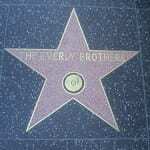 Rock star surname names are a big category, and they’ve gone mainstream in recent years. 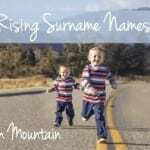 They work on so many levels: surnames are stylish choices for children in general, and these are surnames rich with personal meaning. I’ve looked at all of the rock star surname names before, but I thought it was time to look at them by popularity in the US. This list is based on 2014 data. My guess is that we’ll see a big increase in the use of Bowie when the 2016 data comes out – but that won’t be until May 2017. What counts as a name in this category? Plenty of names with ties to rock ‘n’ roll are first names, like Elvis and Axl. They’re not on this list. And I dropped a few that didn’t seem directly tied to the name’s popularity. Jackson brings to mind King of Pop Michael, but I haven’t heard many parents reference him in their name choice. Cooper is popular, but I don’t think there’s much connection to Alice, and I don’t think Harrison is directly tied to George. 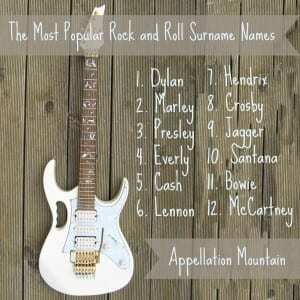 With those caveats, read on for the twelve most popular rock star surnames in the US. Coming in at #12 is McCartney, as in Sir Paul. He and fellow Beatles founder John Lennon were one of the most successful and influential songwriting duos of the twentieth century – maybe of all time. In the 1970s, Paul co-founded Wings. Wings was wildly successful, too, paling only in comparison to his first group. The surname traces its roots to Scotland and Ireland, where it ultimately comes from a personal name that could mean bear – or hero. Either way, it was given to 21 girls in 2014, enough to make it #12 on the list of rock star surname names. Along with Mckinley, McCartney is one of the Mc- names rising as former favorites like Mackenzie fall. Bowie was given to 59 boys and 30 girls in 2014, enough to make it #11 on this list. It’s possible that some parents were inspired by the early 2014 arrival of Gwen Stefani’s third son, Apollo Bowie Flynn. Stefani said that Bowie and Flynn were family names, and indeed, they’re both common. Bowie also brings to mind Jim Bowie – as in the knife. David Bowie was blonde for much of his career, but the charismatic singer was best known as a chameleon, an innovator who changed styles and pioneered sounds. One more reason to imagine this name will rise: with Bowen and Beau on the upswing, it’s a sound that was already on trend. I almost missed Santana on my first pass through the list. After all, this name has been more famously connected to a tough-as-nails cheerleader on Glee in recent years. But the Spanish surname – a contraction of Santa Ana, places name after Saint Ann – is actually much more popular for boys than girls. This makes me think that Carlos Santana, the Mexican-born musician, is the driving force behind the name’s success. Carlos gave his surname to his band, Santana, and they performed at Woodstock way back before they even had a record deal. Since then, he’s racked up 10 Grammys and is widely considered one of the greatest guitarists of all time. 242 boys and 103 girls were given the name in 2014, enough to make Santana #10 on the list of rock and roll surname names. Given to 342 boys and 11 girls in 2014, Jagger ranks a respectable ninth on this list. The name sounds, well, jagged. Edgy even. But it’s not a rock and roll stage name. Mick was born Michael Philip Jagger. It was an occupational name for a peddler, from the Middle English word jag – pack. It’s seen sparing use as a given name since the 1990s. But it was a song by another band that pushed Jagger to its highest rank ever. In 2011, Maroon 5 scored a hit with “Moves Like Jagger,” an a video chock full of archival footage of a young Mick. One year later, a record 466 boys had been given the name. Does Crosby belong on this list? The name’s current claim to fame isn’t musical, but athletic – Sidney Crosby is an ice hockey star, currently playing for the Pittsburgh Penguins. There’s also Crosby Braverman, a character from Parenthood, which recently ended a successful six-season run on NBC. But there are two reasons this name is musical. First, there’s crooner Bing Crosby. And second, the reason it belongs on the rock and roll surname names list, is David Crosby, an alum of the Byrds, best known as a member of Crosby, Stills, and Nash. That makes him a two-time inductee into the Rock and Roll Hall of Fame. 431 boys and 28 girls were given the name in 2014. Maybe it’s a mix of the musical, the athletic, and the small screen’s influence that has pushed this surname name into wider use. Lucky number seven is Hendrix, as in Jimi. In just four years, he recorded some of the most enduring hits in rock and roll history. It’s impossible to talk about electric guitar without bringing up his name. And yet, this name isn’t only about the legend. Even without Jimi’s legacy, Hendrix boosts that great final x, just like Alex and Felix and many other popular names for boys. And we’re mad about Henry, the given name from which Hendrix is derived. For all of these reasons, 498 boys were given the name in 2014, along with 28 girls. Is Lennon meant for a boy or a girl? It’s a true unisex name, given to 358 boys and 399 girls in 2014. Together, that’s 757 children – enough to rank this name #6. John Lennon is remembered for his music, both as a member of The Beatles and his solo work. But he’s also remembered as a peace activist whose life was tragically cut short, following his 1980 assassination. Strawberry Fields in New York City’s Central Park, not far from the entrance to the apartment building where Lennon was fatally shot. The surname has a few possible origins, all Gaelic – little cloak, blackbird, or possibly sweetheart. But the name has taken on a meaning that’s about the songwriter’s interests: peace and possibility. 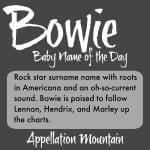 If Lennon is a gentle, gender-neutral name, the rock star surname that stands at #5 on our list is the opposite. Cash is brash, a bad boy name inspired by the Man in Black. Johnny Cash’s music has endured long after his 2003 death. As a given name, the surname started to rise following Cash’s death. But it was really the award-winning 2005 biopic, I Walk the Line, starring Joaquin Phoenix and Reese Witherspoon and Johnny and June Carter Cash that pushed the name into wider use. The singer cultivated an outlaw image, but his surname actually has a gentle meaning. It’s generally considered an Anglicized form of German surname Kirsch – cherry, or perhaps Kirch – church. It’s got nothing to do with money, but it probably doesn’t hurt that Cash is king. Over 1,300 boys were given the name in 2014, along with just seven girls. If Cash is all-boy, Everly is almost all girl. That’s despite the earliest high profile use of the name by rocker Anthony Kiedis, who named his son Everly Bear back in 2007. But the name had been used in small numbers for girls for years. It might have something to do with the musicians, but it’s also a logical name for a girl. It shortens to Evie, and we’ve long loved three-syllable, ends in -y or -ie names for girls, from Dorothy to Kimberly. The surname comes from an English place name, composed of the elements wild boar and clearing. It’s certainly more appealing to think of it as a musical choice! In 2013, actors Channing Tatum and Jenna Dewan gave the name to their daughter. The name had already been catching on quickly, but the high profile birth announcement sent Everly soaring to #178. 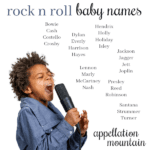 We do love those ends in -ley names for girls, from Ashley and Paisley to the third most popular rock and roll surname name on our list: Presley. Presley needs no introduction. The surname of the King of Rock and Roll, it comes from either an English place name or maybe a German one. But it means just one thing: Elvis. The Mississippi native became a major recording star in the 1950s, a movie star in the decade following, and then made a comeback in the 1970s. He died in 1977, but remixes of his songs have topped charts as recently as 2002 and 2003. This name is more popular for girls – there were over 1,700 newborn girls named Presley in 2014. But it’s not unknown for boys, with a respectable 141 boys called Presley the same year. Marley makes this list because it’s the surname of the immortal Bob Marley, who brought reggae to the world. More than three years after his death, Marley remains among the best-selling and most influential artists of all time. And yet, the name might owe its success not to the musician – but to a dog. Originally an English place name, the surname has a long history of sparing use as a given name for boys and girls alike. It was already on the upswing when John Grogan published Marley & Me: Life and Love with the World’s Worst Dog. The memoir became a bestseller, and inspired a 2008 movie adaptation with Owen Wilson as Grogan. In 2005, there were 651 girls and 93 boys with the name. In 2008, the year the movie was released, those numbers surged to 2,354 girls and 291 boys. It suggests that the dog has carried the day. But if I were a Marley? I think I’d rather be named after the singer. In 2014, there were over 1,900 children given the name, with more than 1,600 of them girls. Bob Dylan took his stage name from Welsh poet Dylan Thomas, making this a first name that traveled to the last spot and back in record time. A handful of boys were named Dylan in the 1950s, their parents likely influenced by the poet, too. But the name really took off in the 1960s, as the singer-songwriter rose to international fame. By the 90s, Dylan was the resident bad boy on Beverly Hills, 90210, and the name was a Top 100 favorite for boys. It seems likely that modern Dylans – of which there have been in excess of 50,000 born in just last five years – may owe less to Bob, and more to the name’s reputation as a solid choice for a son. Or a daughter. Ralph Lauren named his only daughter Dylan in 1974. She gave her name to a successful candy store, Dylan’s Candy Bar. While this name has always been far more popular for boys, a steady current of girls have also worn the name. 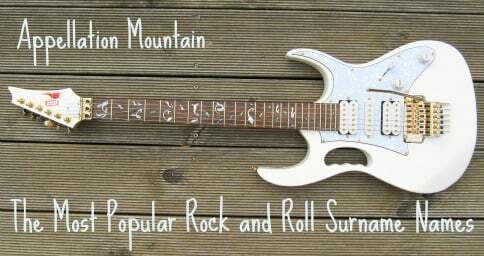 As of 2014, there were 10,350 newborn boys and 822 newborn girls named Dylan – enough to make this the undisputed #1 on our list of rock and roll surname names. What are your favorite rock star surname names? Would you consider any of the names on this list? SO glad to see Santana on this list! Santana is my surname through marriage. The name we chose for my son is one we love, but very popular (it was number 1 name for years until VERY recently). The middle name, Homero, is one we love equally and is an important family name. It might be too unusual for him to go by as far as a “backup” name, however. I had thought that maybe if he grows up and shared his name with too many other people, he could start to go by his surname instead. This makes me think that idea was not too bad! Either as a surname or first name it is a pretty cool name. Bowie was on my radar long before his passing, and even more so now. But I work with a women who has a teenage son named Bowie, and when I started working with her back in May of 2015 I dropped the name from my list because it seemed a little odd to be considering such a unique name that was already at use in the workplace. After Bowie’s death, however, I may put it back on my list. I would consider using it as a middle, except my husband and I were planning on using family names for those two spots. Baby naming is especially hard once you’ve moved from the realm of fantasy to reality! My immediate thought upon hearing of David Bowie’s passing was that Bowie was going to rise in popularity. Only a name nerd, right? Dylan Farrow (Mia’s daughter) is another famous female Dylan.